Babel's Dawn: Broca's Area in Chimpanzees? 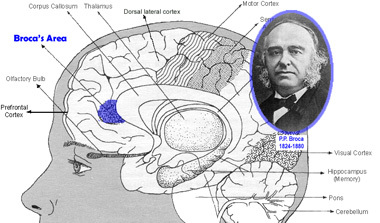 Broca's area was the first region of the brain identified as specializing in speech production. Broca's area is the best known region of the brain that is critical to speech production. If damaged it produces difficulties in speaking grammatically-complex sentences. It is one of those areas whose evolution seems critical to the story of speech origins. Now comes a report from the Yerkes National Primate Research Center that chimpanzees have a homologous region of the brain that is active when they communicate. (See: Jared P. Taglialatela et al March 11 Current Biology, abstract here) The authors speculate that "the neurological substrates underlying language production in the human brain may have been present in the common ancestor of humans and chimpanzees." The report is important, but has to be taken with some caution. Neurological work presented in Barcelona a month ago stressed that speech actions depend on integrating many regions of the brain; the modular idea, as the report admits, is "somewhat dated." (See: Brain Circuitry Challenges Linguistic Models) Even so, there seems no doubt that damage to Broca's area results in a range of failures in speech production. A second caution is that the identification of a Broca's area homolog is not physically obvious. Brain regions are comparable on a gross level, but fine details can be hard to fix, especially in the frontal region where Broca’s Area lies. The front grew extensively during human evolution and is not just a puffed up chimpanzee frontal region. We are not certain of just how much of a homolog the proposed Broca’s Area homolog really is. This interest in attention was the kind of communication tested. A hungry chimpanzee who had not eaten in five hours was fed a small radioactive substance in a drink, so that it could later undergo brain examination via PET scan. After the drink it was still hungry. The chimp was then isolated from other chimpanzees and was allowed to watch while a human brought some food near, but out of reach of the chimp’s cage. The chimp would then attempt to catch the human’s attention and beg for some food. After testing the chimpanzee was anesthetized and given a PET scan to see which areas of the brain had been particularly active. There was a second, control procedure in which chimps performed a non-communicative task. The PET scans revealed that a number of regions (of course) had been active between sipping the radioactive drink and being anesthetized. And voila, the Broca’s homolog (the left inferior frontal gyrus) had been significantly more active during the communicative task than during the noncommunicative control Particularly important, and less ambiguous, is the evidence that when performing communicative tasks, the left side of the brain is more active than the right. So what do we make of this finding? The authors propose simply that the “neurological substrates” supporting language may have been present before the human lineage separated from the chimpanzee/bonobo line. Substrate is a little vague, but we get the idea. The brain cells required to support language were already present, and even organized in a way that makes catching one another’s attention possible. I am inclined to say, however, that this finding is further proof of something long argued on this blog: chimpanzees are smart enough to use language. That’s not the problem. Yet they do not speak. Ergo, something else is fundamental to language. The long, aristocratic prejudice of Western philosophy that the distinctive feature of humanity is our rationality is wrong. I find support for my argument in the February issue of Current Anthropology. It has a long article by Ken Sayers and C. Owen Lovejoy titled, “The Chimpanzee Has No Clothes,” and deserves a post of its own on this blog, but for the moment let me concentrate on something these authors call “Jolly’s paradox.” In 1970 Clifford Jolly argued (first page of his article here) that the more chimpanzees are shown to be skilled in making tools, the less effective their tool-making becomes as a criterion for the earliest human behavior. Sayers and Lovejoy generalize this argument: The more it can be shown that primates can effectively practice something, the less helpful that something becomes as an explanation for what is singularly human. In this case, Jolly’s paradox suggests that the more evidence we gather showing that Broca’s Area (or any other language-specific module) serves a similar function in chimpanzees, the less useful those modules will be in explaining the singularity of human speech. As evolution is a process of modification rather than brand-new creation, how can any aspect of language not have had some pre-modified version in our common ancestor with the other apes? Some aspects will be barely modified and others extensively. The process of getting attention might be one of the least modified aspects and therefore one of the clearest to identify with a homologous brain area in the chimp and man. BLOGGER: New things do appear in the evolutionary tree. So, although feathers are modified scales, you cannot expect some element of feathers to be discoverable in a snake's skin. The point is you cannot assume, just because a feature evolved, that it is represented in some half-form in other species. The issue of getting attention would seem to be widespread, but it seems that animals, including chimps, rarely try to catch one another's attention. The chimps at Yerkes work to catch a human's attention, but not that of their fellow chimpanzees. Well, perhaps chimpanzees do try to catch one another's attention in other circumstances, e.g. in mating. One question - does anyone say whether mirror neurons are involved in this "attention-catching" process? BLOGGER: A search of the article failed to turn up the word "mirror."